Schistosomiasis has been considered as one of the dominant parasitic endemic diseases in Egypt; however advances in the local control programs, have led to a significant decrease in the prevalence of schistosomiasis over the last few years. Renal involvement in schistosomiasis is variable; the incidence of glomerular involvement is 5–6% in patients with active schistosomiasis, whereas it increases up to 15% in the hepatosplenic form. Patients with glomerular involvement are commonly asymptomatic, a fact contributing to the complexity of estimating the real incidence of glomerular affection. Moreover, glomerular involvement can also be self-limited. In addition to nephrotic syndrome, patients with schistosomiasis can also present with isolated subnephrotic range proteinuria, acute glomerulonephritis (GN), or end-stage renal disease (ESRD). Schistosomal glomerulopathy has an immunological nature. Antigens from the parasite seem to be related to glomerulopathy and have been found in the sera of humans and animals infected with Schistosoma. The diversity of the lesions found motivated a clinicopathologic classification of schistosomal glomerulopathies, endorsed in 1992 by the African Association of Nephrology (AFRAN), that recognized the five categories of glomerular diseases; class I mesangial proliferative, class II exudative glomerulonephritis, class III membrano-proliferative, class IV focal proliferative and segmental glomeruloscleorsis, and class V amyloidosis. A sixth category has been proposed to encompass the lesions associated with HCV coinfection. The association of membranous nephropathy (MN) with schistosomiasis was infrequently reported. However, the role of schistosomiasis in the pathogenesis of MP has been called into question based on clinical and experimental data. Almost all associations of MGN with schistosomiasis dates back long before the discovery of the protein M-type phospholipase A2 receptor (PLA2R) and its pivotal role in discrimination between idiopathic and secondary MN. To date, there have been no reports investigating the role of PLA2R in discrimination between idiopathic and secondary MN in schistosomiasis. We report a case of 27-year-old male patient who presented to our outpatient nephrology clinic with periorbital and bilateral lower limb edema of 7 months duration as well as easy fatigability. Associated urological symptoms as well as regular use of NSAIDs were denied by the patient. In addition, there were no manifestations suggestive of rheumatologic affection such as arthritis or arthropathy, photosensitivity, skin rashes, etc. Physical examination revealed a blood pressure of 120/80 mmHg, pallor, puffy eyes, and bilateral pitting lower limb edema up to the level of the knees. The rest of systemic examination was unremarkable. Investigations showed nephrotic-range proteinuria, hyaline and granular casts, and glucosuria with normal fasting blood glucose. Blood tests showed serum creatinine of 2.1 mg/dl, urea 53 mg/dl, serum albumin 1.6 g/dl, complete blood count showed only normocytic normochromic anemia, serology was negative and immunological markers were all normal (C3, C4, ANA, anti-dsDNA). Investigations are shown in Table 1. Chest x-ray showed right-sided pleural effusion; abdominal ultrasound showed moderate ascites, echogenic kidneys of normal site, and size with prominent papillae; liver, spleen, and urinary bladder showed no abnormality. Renal biopsy [Figure 1] was performed. Light microscopy examination showed 33 glomeruli, out of which one was globally sclerosed. The glomeruli showed a membranous pattern of injury. The tubulointerstitium showed frequent large granulomas formed of numerous eosinophils, epithelioid cells, lymphocytes, and foreign body giant cells surrounding elliptical structures with lateral spines consistent with Schistosoma miracidium as well as calcified schistosoma ova. Also there was moderate interstitial fibrosis and tubular atrophy (30%). Arteries and arterioles were unremarkable. Paraffin-based immunohistochemistry using immunoperoxidase staining showed a diffuse IgG and C3 staining along glomerular basement membrane (GBM) (+3). IgA and IgM were negative. Staining with anti-PLA2R antibodies (Lifespan Bioscience) showed diffuse deposits along GBM. Moreover, upper and lower GI endoscopies were conducted in order to exclude a MN secondary to malignancy. These showed no abnormalities. PSA was not raised (1 ng/ml). Chest and abdominal MRI with gadolinium were conducted in order to exclude an underlying malignancy. Serum protein electrophoresis as well as immunofixation showed no evidence of underlying multiple myeloma. Twenty-four-hour urine collection and subsequently electrophoresis (UPEP) and immunofixation were conducted also in addition, which excluded the presence of M-protein. Investigations showed no evidence of an underlying hepatitis B or C infections or syphilis (negative VDRL). After exclusion of the common causes of secondary MN, the most fitting diagnosis was S. mansoni granulomatous inflammation associated with primary (PLA2R associated) MN. Further serological tests were conducted. Serum antischistosomal antibodies, schistosomal antigens, and anti-PLA2R antibodies were all positive. In the current case, praziquantel drug (60 mg/kg/day) was administered in a single dose and repeated after 1 week in addition to ramipril 2.5 mg once daily and enoxaparin as a prophylactic anticoagulant before testing for anti-PLA2R, with no observed improvement in either the renal function tests or the degree of proteinuria that indicated the prescription of immunosuppressive drugs especially after treatment of bilharziasis. Modified Ponticelli regimen was administered over 6 months. Unfortunately, even after completion of Ponticelli regimen, the proteinuria is still progressive (12–15 g/day). Ramipril dose was maximized without any additional beneficial effect. Treatment with rituximab was being considered for the next step. We experienced a case of primary MN associated with schistosomal granulomatous interstitial nephritis. A role of schistosomiasis in the pathogenesis of MN has been debated. In the current case, our patient presented with nephrotic-range proteinuria signifying a glomerular rather than a tubulointerstitial origin. History, examination, and investigations provided no clues for any secondary cause of MN or a separate tubulointerstitial disease. Recently, it has been shown that the presence of PLA2R antibodies supported a diagnosis of iMN, changes in antibody levels were related to clinical disease activity; disappearance of antibodies preceded and predicted subsequent decrease of proteinuria; high titers of antibodies were associated with a low likelihood of spontaneous remission. Anti-PLA2R antibodies were detected in 70% of sera from patients with primary MN, whereas they were undetectable in patients with SLE or hepatitis B as the underlying causes of MN, signifying their importance in differentiating primary from secondary MN. Compared to serum anti-PLA2R antibodies that have a low sensitivity in the diagnosis of primary MN (57%), renal biopsy staining for anti-PLA2R either by immunofluorescence or immunohistochemistry proposes a better tool with a higher sensitivity (69–84%) and specificity (about 100%) to diagnose primary MN.,, In the current study, we detected anti-PLA2R antibodies in serum as well as in renal biopsy by immunohistochemistry, which might imply the presence of huge loads of antibodies that in spite of being soaked up in the immune deposits in the renal tissue could also be detected in serum. In 1988, Sobh et al. reported two patients with MN who showed deposition of circulating cathodic and anodic antigens (CCA, CAA, respectively) in the GBM, however no schistosomal ova could be detected. Whether the presence of these antigens was the etiology of MN or merely an association cannot be confidently assumed. A recent case report from Brazil showed interstitial S. mansoni granulomas associated with MN, however neither was an etiological relation explained nor were anti-PLA2R antibodies screened for. In the current case, we did not screen for bilharzial antigens in the renal tissue, however schistosomal antigens could be detected in serum. We believe that the current case report is the first to describe the use of anti-PLA2R antibodies to identify iMN in patients with renal S. mansoni granulomas. Our case report provides new evidence for the absence of a causal association between schistosomiasis and MN. Meanwhile, it calls into question the findings of the other studies that support such an etiological association. In the light of available evidence, we strongly recommend screening of bilharzial patients with MN for anti-PLA2R antibodies, as there is no available strong evidence supporting the development of MN after glomerular bilharzial antigen deposition. El-Khoby T, Galal N, Fenwick A, Barakat R, El-Hawey A, Nooman Z, et al. The epidemiology of schistosomiasis in Egypt: Summary findings in nine governorates. Am J Trop Med Hyg 2000;62(2 Suppl):88-99. Barakat RM. Epidemiology of Schistosomiasis in Egypt: Travel through Time: Review. J Adv Res 2013;4:425-32. Brito TD, Nussenzveig I, Carneiro CR, Silva AM. Schistosoma mansoni associated glomerulopathy. Rev Inst Med Trop Sao Paulo 1999;41:269-72. Moriearty PL, Brito E. Elution of renal antischistosome antibodies in human schistosomiasis mansoni. Am J Trop Med Hyg 1977;26:717-22. Barsoum R. The changing face of schistosomal glomerulopathy. Kidney Int 2004;66:2472-84. Netti GS, Ranieri E. [Anti-phospholipase A2 receptor (anti-PLA2R) antibodies and idiopathic membranous nephropathy: Which role in diagnosis and prognosis of this disease?]. G Ital Nefrol 2014;31:3. Beck LH Jr, Bonegio RG, Lambeau G, Beck DM, Powell DW, Cummins TD, et al. M-type phospholipase A2 receptor as target antigen in idiopathic membranous nephropathy. N Engl J Med 2009;361:11-2. Debiec H, Ronco P.PLA2R autoantibodies and PLA2R glomerular deposits in membranous nephropathy. N Engl J Med 2011;364:689-90. Segarra-Medrano A, Jatem-Escalante E, Quiles-Pérez MT, Salcedo MT, Arbós-Via MA, Ostos H, et al. Prevalence, diagnostic value and clinical characteristics associated with the presence of circulating levels and renal deposits of antibodies against the M-type phospholipase A2 receptor in idiopathic membranous nephropathy. Nefrologia 2014;34:353-9. Svobodova B, Honsova E, Ronco P, Tesar V, Debiec H. Kidney biopsy is a sensitive tool forretrospective diagnosis of PLA2R-related membranous nephropathy. Nephrol Dial Transplant 2013;28:1839-44. Sobh MA, Moustafa FE, Sally SM, Deelder AM, Ghoniem MA. 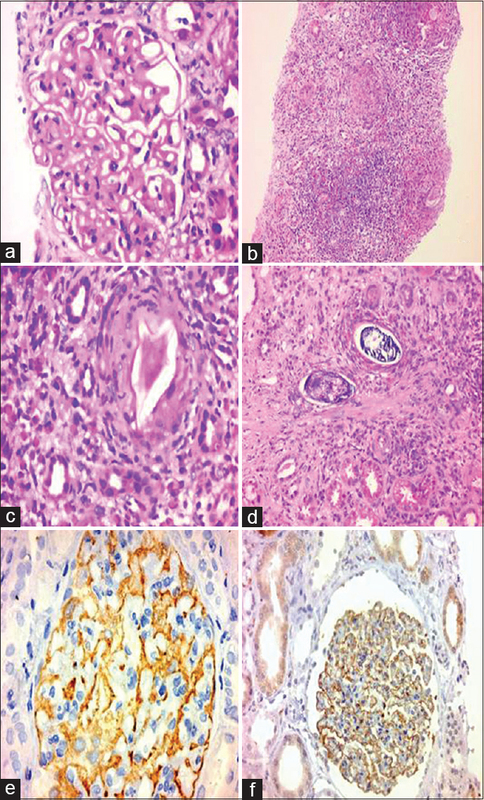 Characterisation of kidney lesions in early schistosomal-specific nephropathy. Nephrol Dial Transplant 1988;3:392-8. Neves PD, Bezerra KS, Silveira MA, Yu L, Woronik V, Jorge LB, et al. Schistosoma mansoni and membranous nephropathy. Kidney Int 2016;89:959.